We supported dozens of meetings that upheld the values of learning, cross-sector collaboration, and being in good relationships with one another. 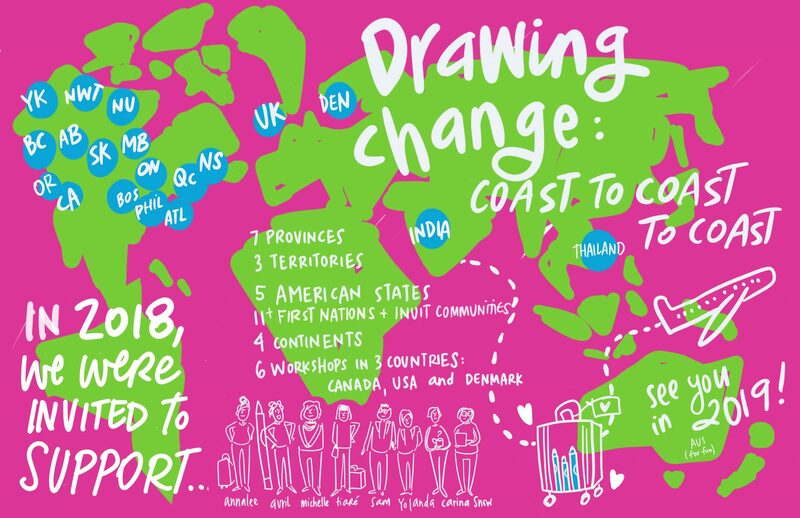 Thank you for your partnerships - we were invited to facilitate and graphic record in 9 provinces, three territories, 5 states, 4 continents, and Indigenous communities (First Nations and Inuit) this year. Our visual facilitation workshop brought together people from Japan, the UK, the USA and Canada to learn and grow visually, with a unique focus on diversity, equity and inclusion. And I had a blast co-teaching with Sophia Liang's at our advanced graphic facilitation lab in Portland! This Being Black and Muslim event was Tiaré Jung's favourite event in 2018, where "Participant stories honour vulnerability and created a tangible human storytelling tool for sharing the impact of meaningful conversation beyond the room." Bilingual graphic recording - Annalee Kornelsen is one of Canada's only French/English bilingual graphic recorders, and she supported Unifor in Halifax this year as well as translating posters for other projects. Merci! In 2019, I'm looking forward to more professional development with the Emergent Scribing community, facilitation work with the World Health Organization, and more teaching. I want to celebrate your creativity in whatever form it takes - from napkin sketches to practicing on the office whiteboard, here's to your ongoing creativity, wherever your meetings may take you. Our next Graphic Recording & Facilitation workshop is May 11 & 12, 2019! Registration is live on Eventbrite, and spots are filling up. Send us a note at hello@drawingchange.com if you have questions - we can't wait to meet you!